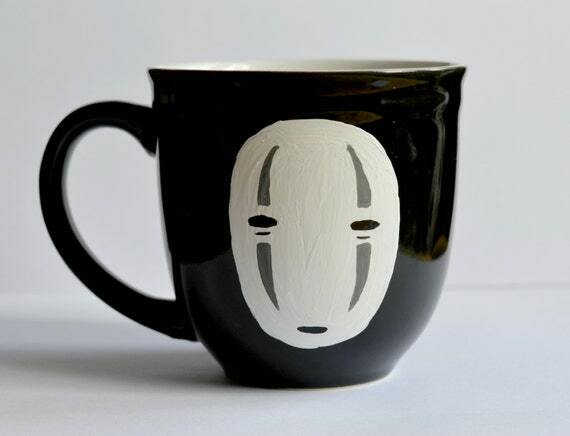 Home » Studio Ghibli Decor » Spirited Away Mugs- Perfect for Tea or Cocoa! 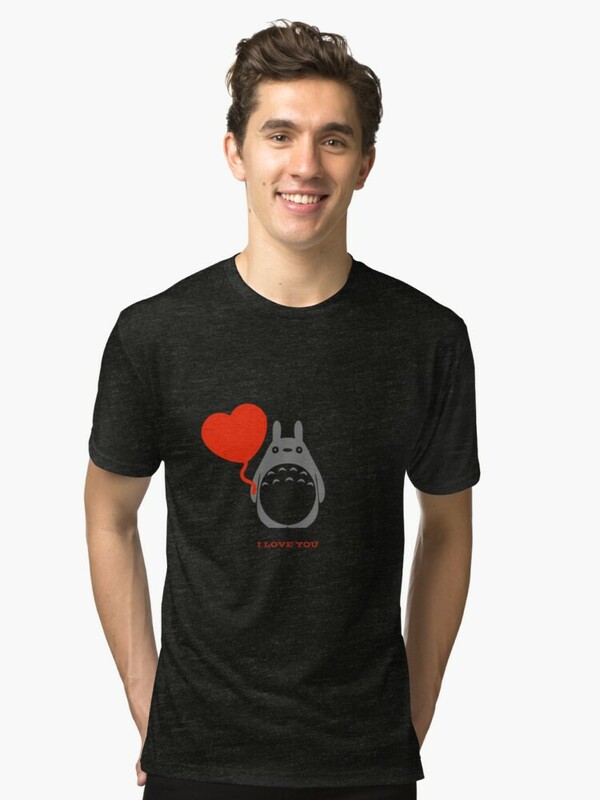 Starting your day with a mug of tea and ending your day with a mug of cocoa is much sweeter when drinking your favorite beverage out of one of these adorable Spirited Away Mugs. 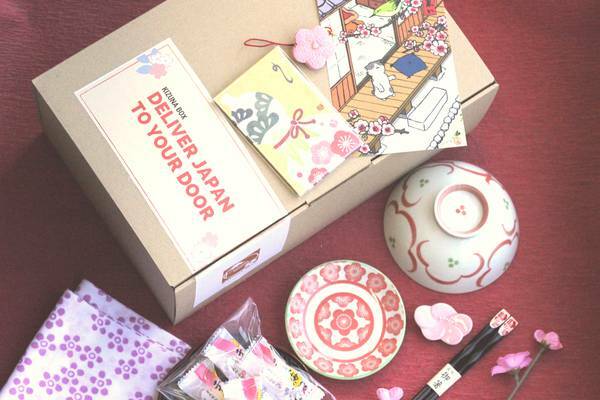 Simple, cute, and handmade or detailed and magical…. Whichever you choose, these mugs are sure to hold a special place in your world. 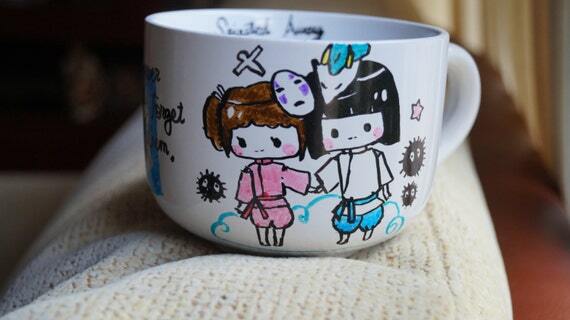 And I bet, if there is a Studio Ghibli fan in your world, they would love to have one of these Spirited Away mugs too…. 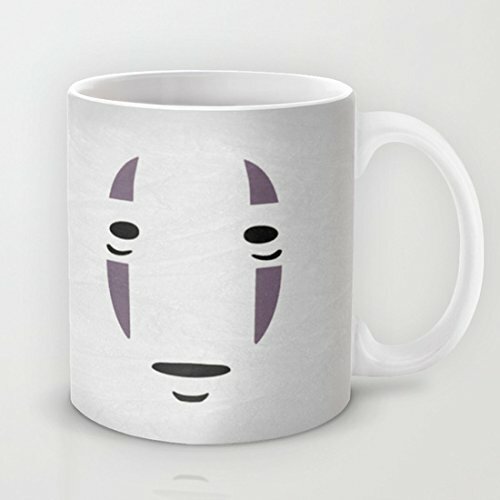 There are loads of designs and styles to choose from in this selection of Spirited Away Mugs! 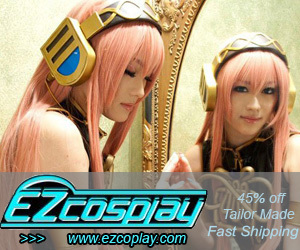 Some are even hand thrown or hand painted so they are totally unique! 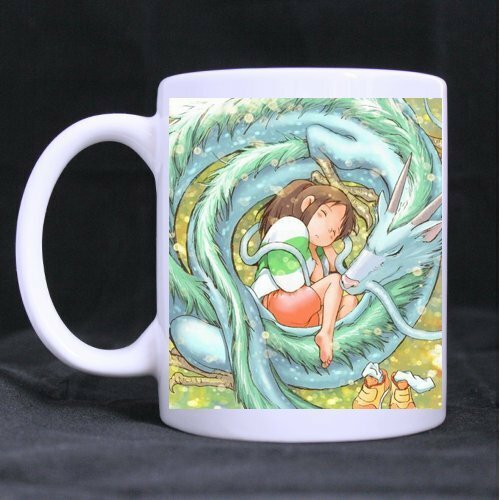 What a beautiful image of Chihiro sleeping wrapped up in Haku… This “morphing mug” only shows the picture when it is filled with hot liquids, otherwise the mug is solid colored. The image appears like magic! Which is totally appropriate for this magical film. 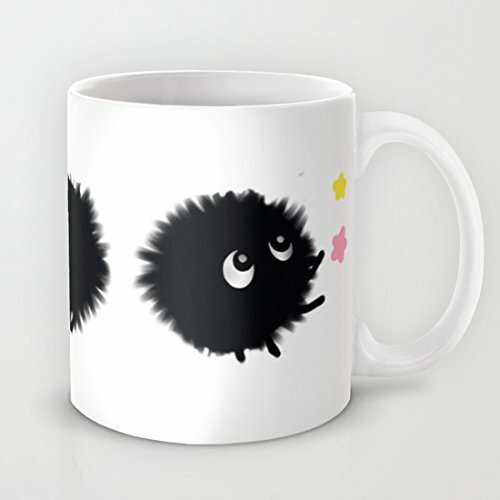 Soot Sprites with their favorite food, Konpeito, dance around this Spirited Away mug that is guaranteed to bring a smile to your face, even first thing in the morning! Dishwasher and microwave safe means that not only is this mug nice to drink from, it’s easy to take care of! Both sides of the mug are shown below…. one side shows Chihiro riding Haku as a dragon, the other shows them holding hands. 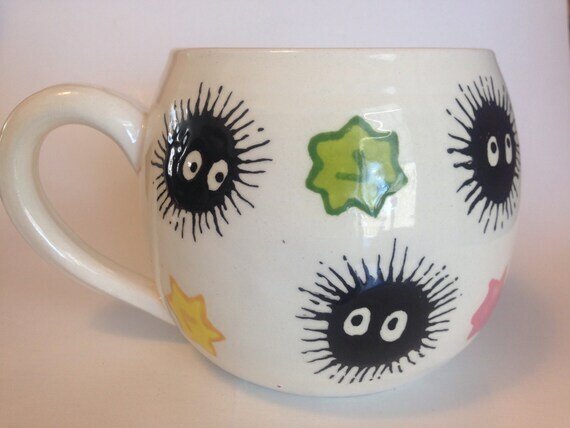 Inside the mug are Soot Sprites! 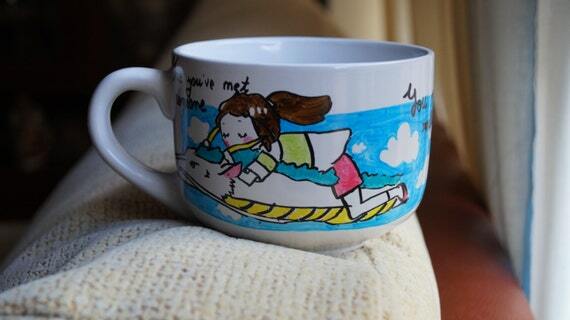 These hand illustrated mugs are made to order, and each is slightly different. Best part… the mugs are large enough to make the biggest cup of cocoa ever! All you see are bits of No Face, but it’s enough to recognize his striking presence. This simple but beautiful mug is microwave and dishwasher safe… perfect for quickly warming up tea and then washing up. 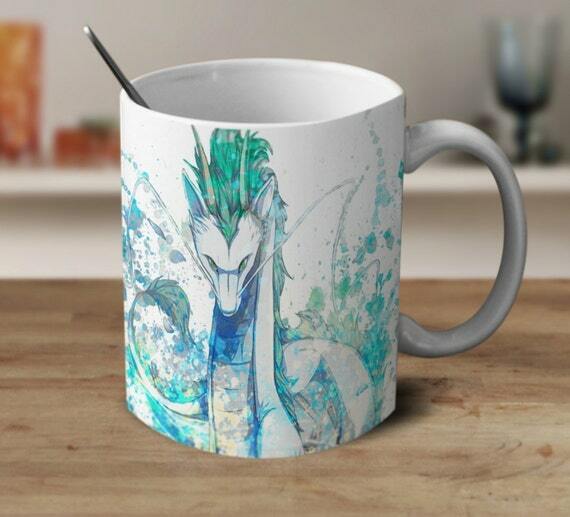 This mug captures the beauty of Spirited Away with its watercolor image of Haku. Because it’s another color changing mug, you need to add hot liquids to get the full effect. Still… it’s quite breathtaking. Starting and ending with Soot Sprites, because these cute little creatures just make me so happy!